Take Up the Quest to Learn Puppet - T.B.D. The folks over at Puppet Labs have updated their Learning VM. The Learning VM is a pre-configured virtual machine that you can use to become familiar with Puppet, the IT automation software. 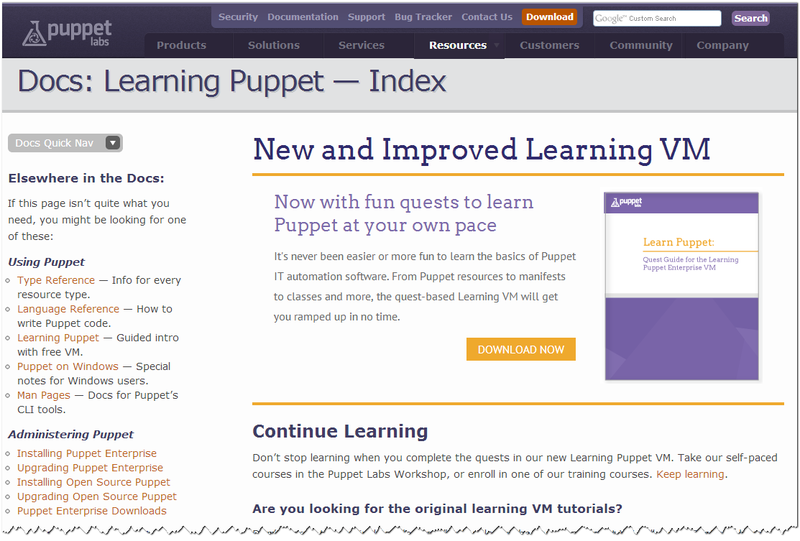 The Puppet Learning VM requires a virtualization environment to deploy to. Suitable VMware products includes VMware Workstation, VMware Fusion or VMware Player. Alternatively you can use an OVF compatible product such as Oracle VirtualBox. For our purposes, we’re going to assume that you already have VMware Workstation installed on your Windows computer. Puppet Labs states that the requirements for the Learning VM are a network connected laptop or desktop computer with at least 10GB of free disk space, 2GB memory and a 2.5+ Ghz speed CPU. I’d recommend making sure you have 2GB of available memory above the memory your OS needs. This means a machine with 4GB or more of RAM will do the trick. Head on over to the Puppet Learning website. Click the Download Now button, then fill out the form on the next page. Only the email address is mandatory. Registration form for the Puppet Learning VM. After successfully registering a Thank You page comes up. 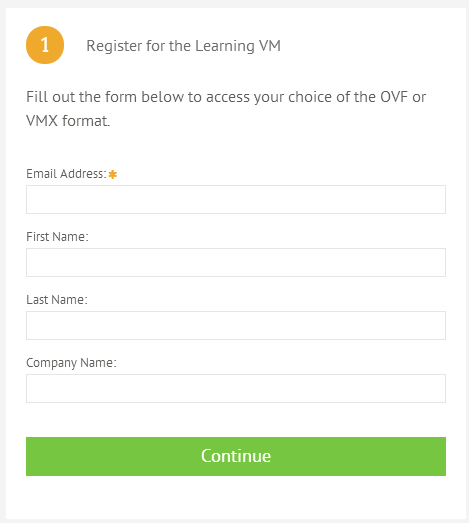 Click the Download VMX button under step 2 to begin the Learning VM download. Note that it’s almost 2 GB so it may take a few minutes depending on your Internet speed. Click the Download VMX button to start downloading. Extract the contents of the downloaded zip file using your tool of choice to its own folder (if you need a tool we recommend 7-Zip). If you like to keep your virtual machines together, the default location for VMware Workstation VMs under Windows is %USERPROFILE%\Documents\Virtual Machines. You should have a folder with these three files. Open up the Quest_Guide.pdf file, follow the instructions for VMware Setup, and now you’re ready to following along with the guide and learn about Puppet. 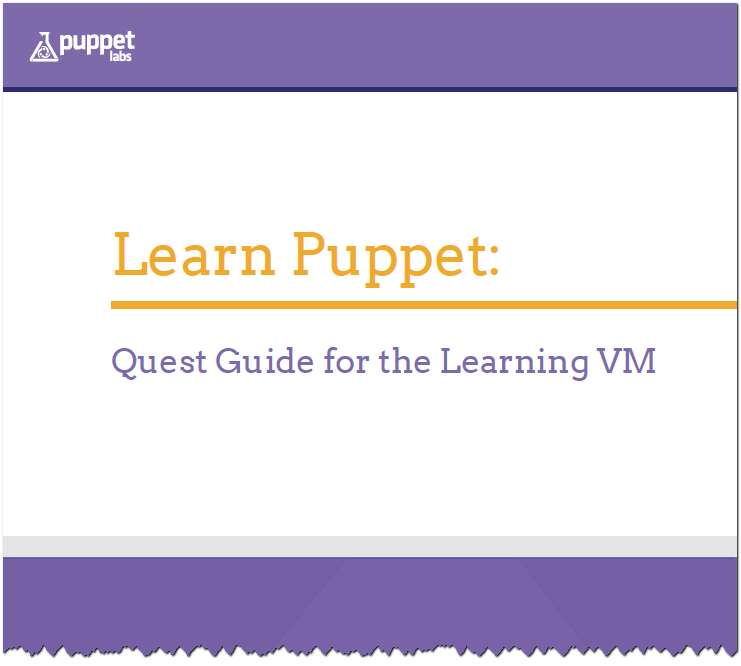 Puppet’s Quest Guide for the Learning VM.